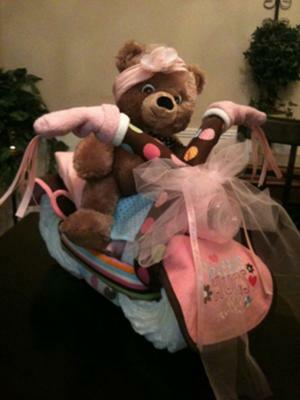 Create a work of art for the Mom-to-be like this Motorcycle diaper cake from Michelle! 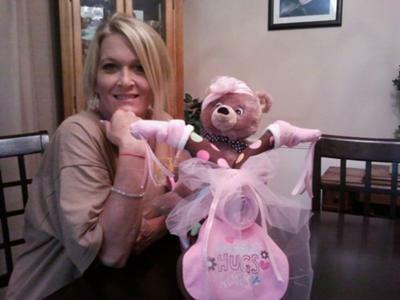 She went all out and made this incredibly creative diaper cake! We love posting (and showing off) the unique and fun diaper cake ideas from our readers. Thanks for paying it forward, Michelle! Your diaper cake is awesome! This was my 2nd diaper cake and my 1st attempt at making a motorcycle diaper cake. I had seen this on a website and decided to try and make it for my husband's best friend and his wife since we ride motorcycles. The entire thing is made from diapers (sz 1), 3 baby bibs (for the tank and fenders), 3 receiving blankets (handlebars and body), a onesie (the seat), a baby bottle (headlight) and 2 pair of booties (grips on handlebars). My next cake....is for a friend that plays with my husband on the praise team at church...it will be a guitar and a set of drums.